In my analyses of monthly employment stats, I’ve written about ‘zero-hours contracts‘, and the matter has been receiving some media attention over the last week or two. ZHCs, as the name implies, are contracts in which a person is considered employed by a company, but is not guaranteed any hours of work at all. They’re simply paid for what they do, and not paid if they don’t do anything. These contracts put all the power in the hands of employers, and all the risk onto the employee, Employers don’t incur any cost if they don’t need an employee’s services in a particular period, and avoid liability for holiday and sickness pay. In effect, it’s a way of making an employee bear all the disadvantages of being self-employed – but without the potential benefits of self-employment in being able to claim for business expenses, mileage etc. Because a person on a ZHC contract is technically employed, they can’t claim unemployment benefit. Whereas under a casual hours contract they’re free to do other work if not required by the employer, and to decline any hours offered if not convenient, under a zero hours contract the employee is obliged to turn up if offered work and to keep him/herself available in case required, severely limiting opportunities to do other work and earn a secure living. Basically, a ZHC almost amounts to a kind of bonded casual labour, but without the freedom that casual workers enjoy. Last week, someone asked me whether I had any information about ZHCs in the NHS, because they know I research, and write about, the NHS a lot as well as having mentioned ZHCs before. I answered that I didn’t – but that I was very interested to find out and would fire in Freedom of Information requests on the matter to half a dozen NHS Trusts to see what came back. FOI respondents have up to 20 working days – a calendar month, more or less – to respond to FOI requests. I was therefore surprised and impressed to receive a very detailed reply from University Hospitals Bristol NHS Trust only a day after submitting the request, and I wrote back to express the same, as well as my appreciation for it. 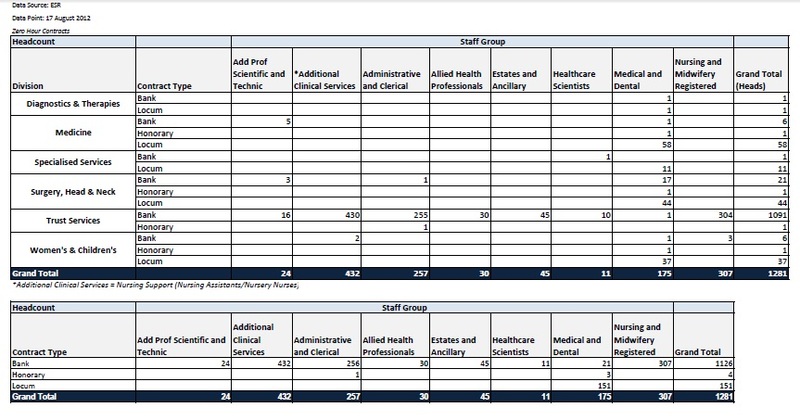 Just in case it doesn’t show clearly on your screen, the table shows that an incredible 1281 people are employed on ZHCs by just that one Trust. This total includes 432 healthcare assistants and nursery nurses, 307 nurses/midwives, 60 medical doctors, 61 surgeons and 257 admin/clerical workers. Now, the request included people employed by subcontractors and this information was included, so not every person in the table is necessarily employed directly by the Trust on a ZHC, but the total figure is still staggering: 1,281 people with working in a single trust in such a critical sector with no security of income, no guaranteed hours, no sick pay and no holiday pay. Fair play to the Trust for providing such complete information so rapidly. But to see such a high number portrayed so starkly for a single Trust means that the total for the entire NHS almost beggars imagination. The government’s claim that it can be trusted with the NHS was already patent nonsense. But it’s already very plain that they’re putting the NHS under such cost-pressure – despite it already being the 2nd most cost-effective health service in the developed world – that the Trusts are being forced to deprive people of even the most basic security in order to achieve unrealistic spending targets. I’ll post the information from the other Trusts to whom I sent requests as I receive it. But it’s already clear that this issue is something that Labour needs to make a point of addressing vigorously – and that if the number of ZHCs in the NHS are this huge, then the scale of the problem across the whole country and across all sectors must be causing massive over-reporting of the level of employment. In this context, the government’s performance on employment, the economy, and social justice is even worse than we already knew. This shows the figures for ZHC’s now. Is it possible using FOI to find out how these have changed during the last couple of years, or whether these have always been in place and have just carried over. If they have gone up dramatically then it really would be a powerful tool for Labour. The figures include bank staff on ZHCs, which have a different definition from casual hours contracts and are very distinct. On a casual contract you can turn down work offered. Casual contracts can therefore be easily combined with a main job. Under a ZHC, you’re obliged to take work if it’s offered. This can’t be combined with a main job because you’re effectively ‘on call’ and expected to work whenever you’re needed. My FOI was specifically about ZHCs and not casual. Fantastic – will do so tonight! I don’t think this is right. I have been a bank nurse in UBHT (albeit some time ago). Bank is a casual contract, not a zero hours contract as you define it. I think they have misinterpreted your question. Honorary contracts are used for those on clinical placements whilst in training or research, so although they are technically zero hours, they are still not as defined. ‘Zero hours’ is a tightly-defined legal term, but I’ll check whether they’ve included casual! Also, when you sign on, you don’t get the first 3 days you claim for now. But i don’t know if that means you’d get no JSA-IB for the week your ZHC doesn’t amount to 16 hours. My last boss was nice and i’ve avoided them since. That’s extremely interesting stuff – how sure are you of the facts? Is it based on experience? I took a part time job as a breakfast chef on agreed 20 hours per week. My employer, after 2 months, said I would need to sign a contract as he was happy with my work. I was then presented with a zero hours contract to sign which id never seen before and hadnt been discussed. When I queried the terms, as I do other work as well, he fired me saying he didnt want to be in a position where I had employment rights over hours. Is this legal and does it have to be advertised before you start the job. You might have a claim for breach of a verbal contract if he promised a certain level of hours, though it would be hard to prove. Worth finding a solicitor who gives the first 30/60 minutes’ consultation free and finding out – ideally one who specialises in employment cases. Even if you don’t have an actionable case, it’s despicable behaviour on the part of your former employer and it sounds like you’re well rid! Hope you found a better job with a better employer. thanks – i’ll let you know how i get on! If you require raw historic Jobcentre postings you can find these at http://ftp.zois.co.uk The type of contract that you’re describing are generally flagged as Part-Time, but self-employed. The terms that they use vary, so not that easy a mechanical search. As with SOC Code Zero, things can be obfuscated, should they become too obvious. Hello. I work at the Resolution Foundation, a think tank that focuses on people on low to middle incomes. We’re doing a project on precarious employment, including zero hours contracts, and are looking for people with experience of zero hours contracts to talk to. If you’re interested in telling your story and helping us expose these issues further, please get in touch vidhya.alakeson at resolutionfoundation.org. Thanks very much.